Have you ever seen a child asleep in a kitchen chair that's placed on a scooter which is in motion? Apparently it's common practise in Taiwan, where this video was shot. 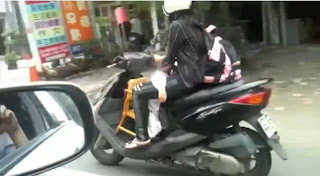 Although the child seems to be wearing a helmet, that chair doesn't look too secure.